No one is claiming that an IRS audit is a cakewalk. But rest assured, a tax audit is probably less likely -- and less gruesome -- than most people fear. Then there's the timing issue. The IRS isn't allowed to swoop down upon you just any old time. In most cases, the agency has only three years in which to take action -- beginning with the original due date of your return. So for a 2011 tax return that was due on April 15, 2011, the IRS clock runs out on April 15, 2014. There are some cases in which the clock runs longer: The IRS has six years to take action when they believe that your income was understated by 25% or more. And if they decide that you seem to have filed a fraudulent return... well, then the clock never runs out. There's no time limit. Fortunately, it's rather easy to avoid a bad experience. If you don't commit fraud with your return, you don't have to worry about getting nabbed. Plus, it's unlikely that you'll accidentally understate your taxable income significantly if you're filling out your return responsibly. Most of us receive forms from employers and others precisely detailing our income. That said, even if you are audited, it's often not a big deal. Most audits don't involve going over every bit of your return -- they typically focus on a particular question. Finally, be aware that you can reduce your chances of being audited. For example, you can fill out your return very legibly. And be sure to include all your income. Remember those 1099 forms you get in the mail? Well, the IRS gets that same data, and its computers will be expecting your return to match up with it. 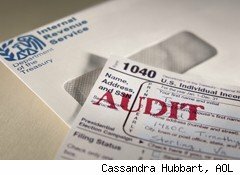 For most of taxpayers, there's little need to worry about tax audits. Especially three years after your returns are due.